Discover inspired design solutions for an organized life. Imagine a peaceful haven in your home enhanced by colors and textures you love. At ClosetPlace we have one simple goal: to bring serenity and harmony to your life with beautiful design solutions. That's the thing, designing the perfect closet is about your life. Discover life organized. *ORG Home Authorized Dealer* Hungering for a more creative and productive space? 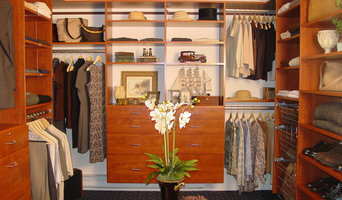 Coast Closets provides stylish, custom-made storage solutions in the finest grade of TFL, veneered and solid hardwood. Our expert team offers both full service installation and DIY options at a fraction of the cost of national competitors. Open 12 hours a day, 7 days a week Most free in-home consultations performed within 24 hours Full service to New England, New York, Pennsylvania, Florida in Tampa, Lithia, and beyond Expect excellence. Every one of our projects is backed by a lifetime quality guarantee and reinforced by an impeccable A+ Rating with the Better Business Bureau. Read what clients have to say about our work. Creative Storage Solutions We construct custom closets and organization systems for bedrooms, entryways, laundry rooms, pantries, home offices, garages – practically any place you crave order. If you need sleeker entertainment systems, wall beds, library shelving and storage areas, we do that too. Equipping a commercial space? We fully fabricate workstations, cubicles, desks and filing cabinets that withstand the heaviest use. Talk to us about your organization challenge. Helene has been creating individualized storage solutions for clients since 2004. Passionate about function and form, Helene strives to build aesthetically pleasing designs which make her clients' busy lives easier. Using a personalized approach during the design phase ensures a well-thought out customized finished product. Recent projects include home offices, entertainment units, garages, wall beds, closets, and more. Helene specializes in being part of a building team with interior designer, architect, and construction partners. Closet Factory Boston is a locally-owned franchise which manufactures its products in Massachusetts. With a wide range of options and material selections, these storage solutions can fit into any style home, from antique to contemporary. I'm a professional opera singer with a strong streak of organizing passion! I'm Kay and I'm the owner and founder of Hub Neat professional organizing services, now called The Organized Soprano. I wasn't always so organized! I began my career as a professional classical singer, receiving degrees from The Boston Conservatory and Longy School of Music. Singing is a passion of mine and I maintain an active career as a singer in the Boston Area. I also have a passion for organizing and all things organization. I am the host of the YouTube Channel: The Organized Soprano which features life as a professional organizer and home tips as well! I was a Container Store employee for almost 7 years and am an Elfa and Shelving expert and also available to help design the beautiful solid custom closets, TCS Closets. I am also knowledgeable about general merchandise and how to make the most of your Container Store shopping experience and how to use the products in your home. I also am a representative for New England Closets, designing beautiful custom built-in closets for a fair price and amazing customer service. *Authorized Inspired Closets Dealer* Serving your entire home organization needs is what we do. Whether you start with closet organization, specially designed cabinets for your garage, or a Murphy bed, we're here to help you. Our experienced team is excited to develop an understanding of your needs and your budget and create a home organization solution just for you. Our 1-day installation will minimize disruption and declutter your home in a flash. Looking for an organizer for your walk-in closet, bicycle garage storage, or kitchen pantry? Our professional designers are trained to provide home organization solutions perfect for your needs. For all your storage solutions. We offer custom closets, garages, laundry and so much more. Call us today for your free estimate. 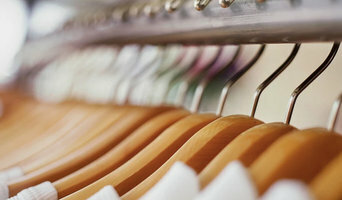 As a senior designer for Closet Factory for 10+ years, I work closely with my clients to provide exceptional customer service and creative storage solutions to meet your specific needs. I am an expert space planner and project coordinator for simple to spectacular closets, home office, pantries, laundry rooms, mudrooms, wall beds, garages and more. I love what I do and it shows in my work. As your local organizational Specialists, Tailored Living featuring Premier Garage is dedicated to bringing Southern and MidCoast Maine outstanding service and personalized organization solutions to fit your home and lifestyle. We can help you create personalized storage solutions for closets, home offices, pantries, mudrooms, and laundry rooms. In addition, with our superior Premier Garage storage and flooring products, we can transform your garage into a fully functional, less-cluttered space! Call us for your free, no pressure, no obligation, in-home consultation. We look forward to meeting you! We can help you create personalized storage solutions for closets, home offices, pantries, mudrooms, and laundry rooms. In addition, with our superior Premier Garage storage and flooring products, we can transform your garage into a fully functional, less-cluttered space! POSH provides customized professional organizing services throughout the Greater Boston area with nationwide availability for residential and commercial clients. We offer a hands-on approach to creating functional, stress free and productive environments. We are an organizing service for people who want more time to do what matters most. Heidi Solomon, the founder of POSH was a featured expert on channel 7 and POSH was awarded Best of Boston Home in 2012. Maine made custom storage solutions for throughout the home. Because we build the systems in our own shop, unique or difficult spaces are a specialty. With 15 years experience, we have done work in more than 140 Maine and New Hampshire cities and towns. Our work ranges from the simple to spectacular, with an emphasis on your needs, your style and your budget. Free design consultations. At ShelfGenie of New Hampshire, we design and install custom pull out shelving solutions that will transform the way you feel about your home. Designed to fit the existing cabinets and closets in your kitchen, bathrooms, pantry or anywhere you have a shelf! Greater visibility and access will create more usable storage space to get you organized and keep you that way! Creative Closet Solutions designs & installs custom closets and storage solutions for organization throughout your entire home. Each space is completely customized to meet your style, budget, immediate needs as well as long term plans. Before hiring a professional organizer, consider exactly what you need. Have you just moved into a Rye, NH home and have no idea where to put everything? You may want to consider an organizer who specializes in room-by-room space planning or estate organization. Perhaps you’re faced with a tiny closet and an overflowing wardrobe. In that case find a professional who focuses on closets to help you get back on track. Also consider the types of objects that need organization. Are they items like books, family photos, files or collections? You’ll want a professional organizer who has experience designing custom systems with Rye, NH companies that will best fit your needs. Find a professional closet and home organizer on Houzz. Narrow your search in the Professionals section on Houzz to Rye, NH closets and home organization.